These guys made this charity that has helped raise over 7 million dollars for children's hospitals. Now these guys decided, 7 years ago, to play the boringest, longest, dumbest game that was ever coded. A game so bad, it wasn't fit to produce. It is a game we like to call "Desert Bus". 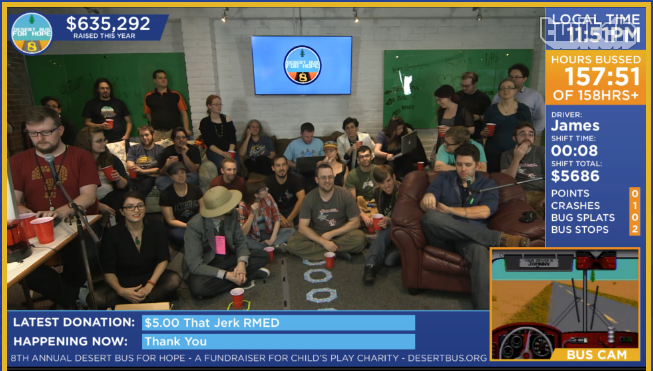 For, as of last reckoning, 77 hours, someone will helm the Desert Bus for Hope while the rest of the crew sing, dance, do sketches, do interviews with some interesting people and generally be your monkeys until the donations are not enough to buy another hour. Each hour costs 1.07*cost of the earlier hour, with the first hour starting at 1$. 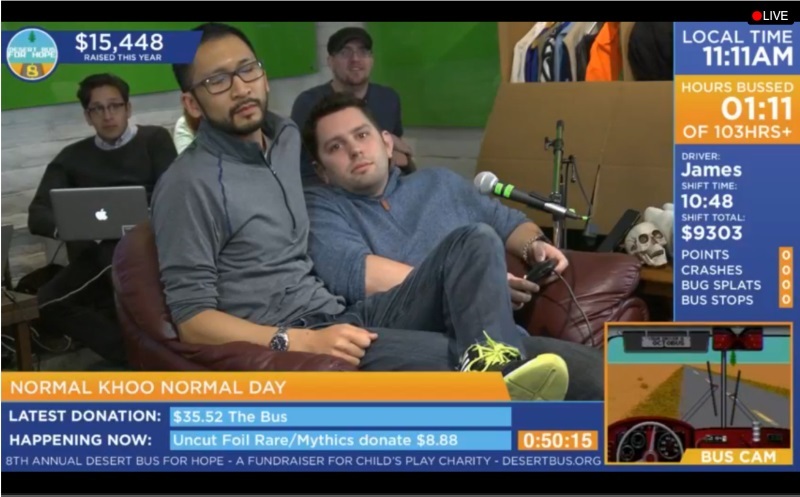 As of now, it'll cost 129.10 $ to extend the Desert Bus for Hope another hour. Will you continue their suffering... for the children? Oh, and I guess this could be the Child's Play 2014 thread? 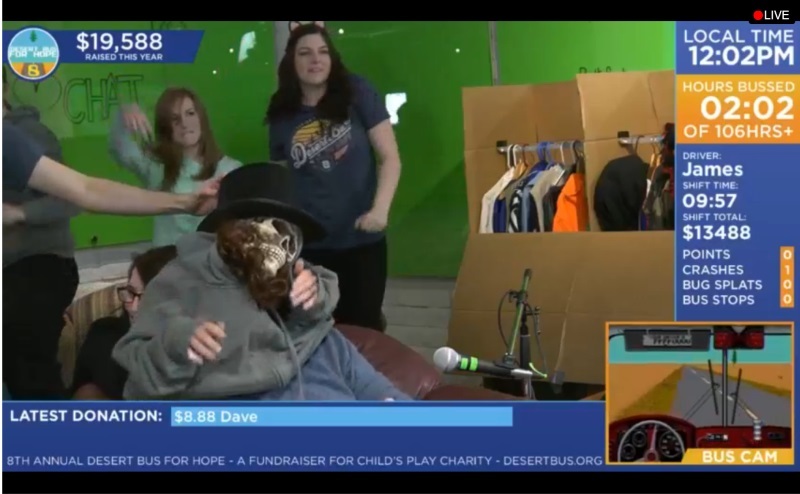 EDIT: So desertbus.org. Go donate, or something. I'm sorta sad it won't be in the Moonbase this year, but the Lunar Module should help things out immensely by actually having room to do things in. It's almost time to JAM ON THE GAS, and they've already collected $6k. 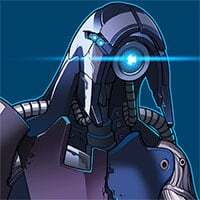 BTW, it's not incredibly obvious, but if you are going to bid in auctions this year you need to have a donor account on the website and then link it to your Twitch account. Go into your profile on the DB page, and there'll be a little green + next to Twitch Accounts. Click that, and it'll send you to Twitch to confirm your login. EDIT: Also, FanGamer has this year's t-shirt up for sale. They're not pre-orders, they've already made them and will be shipping them out ASAP, so might want to get it early. That looks more like a profound sense of comfort with his companion. I'm amazed James hasn't crashed yet during this whole Skeleton Abraham Lincoln thing. Holy bussing hell, there was just a epic auction battle for a set of Pinny Arcade pins. 5500 for a bunch of the rare/limited edition pins, which pushed it over $40k. 2 million lifetime. So great a moment. So happy it was on Alex's shift, because Alex. Holy bussing crap, some wild suits just appeared. They were super effective. Today is a day of miracles. Notch has been dethroned as the highest DB bidder on one auction. By one dollar. Dengler had already 10001'd on a Mikey auction (the one with the firefly sword). Apparently. And Penn brings the value. It's crazy, but he just cloned this pig and is offering it to the three top bidders if they all bid over 7 grand. They're trying to work things out now with the auction system. EDIT: Oh god, Fangamer you beautiful trolls. They added in extra just so they can hit that even 600k moment, plus just to screw with Paul because he was trying to sing a song for a contest. I gave more than initially intended, which is a predicament I knew would arise. I took no steps to combat this inevitable possibility. Also, did they really only crash once this year? Bahahahahahaha, oh my Cheesus, not even close. Beej crashed six times himself. The counter resets every shift. In case anyone missed the link in chat, BigGiantCircles did their annual remix. EDIT: And of course that's what THE SWITCH does. Hard-wired to start the FINAL BUSDOWN.